Home HealthConditions and Diseases Microchip That Can Help Blind People See! Microchip That Can Help Blind People See! It is nothing short of a miracle for blind people to regain their vision and see again, and this may become a reality sooner than you think, thanks to a microchip the size of a small grain – or should we say, thanks to the researchers who spend years on research just to make this happen. 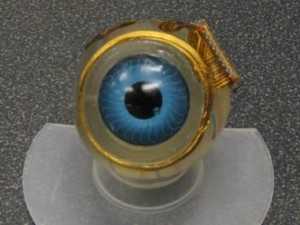 Researchers are exploring the possibility of using microchips to bring back sight for the blind. They are closer to creating a retinal implant that will have the capability of bypassing all the damaged cells and offer visual input directly to the brain. This eye-implant is meant for people with retinitis pigmentosa or age-related macular degeneration, which are the two main causes of blindness. This retinal implant takes complete control of the damaged retinal cells by providing electrical stimulation to the nerve cells that normally carry visual input to the brain from the retina. This microchip may not be able to restore vision to normalcy but it would help blind people navigate a room or walk down a sidewalk more easily. Even a blurry picture of their loved one or the ability to maneuver on their own, is a blessing for a completely blind person. Patients who received the microchip implant will have to wear special glasses fitted with a tiny camera that sends images to the microchip implanted in the eyeball. The glasses also come with a coil that transmits power to the coils surrounding the eyeball. When the microchip receives visual information, it activates electrodes that stimulate all the optical nerve cells near the retina that carry signals to the brain, totally bypassing all the damaged layers of the retina. The one thing that perplexed researchers was to understand the kind of vision this direct electrical stimulation can produce. This research team started to work on answering this question about ten years ago, by fixing electrodes to the retinas of six blind patients for many hours. On activation of the electrodes, patients could see several “drops of blood” or “clouds,” and this number corresponded exactly with the number of electrodes that were stimulated. Without this electrical stimulation, the six patients could see nothing. These tests proved to be a turning point in the research and helped researchers understand that stimulation of the retina does actually produce some vision in blind patients. This is what motivated researchers to go ahead and create an implantable chip. Their ultimate goal is to create a chip that would work for at least 10 years. The road was full of hurdles and researchers had to face several issues trying to come up with an implant and procedure that does not harm the eye. Initially, they attached the electrodes directly to the top of the retina from inside the eye, but they soon realized that this carried the risk of damaging the delicate retina. Now, this implant is attached to the outside of the eye instead of inside, and the electrodes are implanted behind the retina. This location reduces retinal tearing and also does not need extensive invasive surgery. Human tests have not begun yet and this has only been tested on Yucatan miniature pigs, which have the same sized eyeballs as humans. They have been implanted in these pigs for about 10 months successfully, and now researchers are ready for human clinical trials. The prototype is scheduled to be tested in blind patients within the next three years. This latest quest of MIT will be of interest to thousands of people like Rob Spence, who is a Canadian film maker. He has been looking to put a tiny wireless video camera into his empty right eye socket, in order to see the world around him. A retinal implant may just prove to be the perfect solution for him and many others like him. The most important thing for blind people is to be able to recognize faces. Kelly says, “If they can recognize faces of people in a room, that brings them into the social environment as opposed to sitting there waiting for someone to talk to them.” Hopefully, millions of blind people will be able to very soon. Now You Can Grow New Natural Teeth To Order! My husband lost his vision due to auto accident 1992 I would like to find out how he could become part of the research. He has not seen anyone in the past 17 years our youngest was 2yrs old the last time he saw him. my mother is legally blind and i believe that she would be willing to be a test case. i just want her be able to see again, before she misses everything around her: She is a great person and deserves to be able to see. i believe she has retinis pigmintosa. she hasnt been able to see since she was in tenth grade. MY MOTHER HAS HAD IRREVERSIBLE EYE DAMAGE TO TO BEING A DIABETIC FOR 30+ YRS. MANY BOTCHED SURGERIES LATER VERY LITTLE SIGHT LEFT. SHE TELLS HERE EYES ARE GETTING BETTER, BUT REALLY SHE SEE LIGHT AND DARK SHADOWS. TAKES ALONG TIME FOR EYES TO ADJUST TO INDOOR/OUTDOOR HAS GOTTEN WORSE. ANYTHING IS BETTER THEN SITTING IN DARKNESS. SHE IS ALSO HAS OTHER MEDICAL CONDITIONS WHICH HAS DECREASED HER ABILITY TO ENJOY LIFE. BUT THOSE THINGS NOW ARE UNDER CONTROL. I WANT TO GIVE HER SOMETHING TO IMPROVE HER LIFE AS SHE NEW IT. SHE IS ONLY 62. THANK YOU. My husband lost his vision due to surgery 2004 I would like to find out how he could become part of the research. He has not seen anyone in the past 6 years..